John Deere will be represented at SALTEX 2015 by regional dealers Farol, Henton & Chattell, Tallis Amos Group (TAG) and Turner Groundscare. The joint display will feature models from the company’s comprehensive range of commercial ride-on and walk-behind mowers, compact tractors and Gator utility vehicles. New machines on show will include the X950R rear-discharge diesel lawn tractor with mid-mounted mower deck and rear high-tip collector, a 1580 TerrainCut outfront rotary mower and John Deere’s biggest zero-turn mower, the ZTrak Z997R, alongside a 3045R mid-chassis compact utility tractor equipped with an AutoConnect drive-over mower deck. The deep design of the decks available for the X950R allows a constant grass flow and easily copes with both very low and tall grass. A unique single multi-function hydraulic lever makes the collector and deck operation extremely convenient, and also controls front mounted implements. The 1580’s robust two-speed hydrostatic transmission with Twin Touch pedals is ideal for working in rough terrain and tough grass conditions. It also allows faster working speeds and a transport speed of up to 25kph (15.5mph). Additional attachments such as a front-mounted brush or blade allow both these machines to be used year round for other commercial applications, including both leaf and snow clearance. Also dedicated to minimising downtime, decreasing operating costs and improving performance, the powerful Z997R is based on a heavy-duty frame and features a shaft drive to minimise deck belt replacement, as well as flat-free front tyres. The 3045R is equipped with John Deere’s established automatic eHydro transmission, which combines a three-range electronic hydrostatic unit with the simple to use TwinTouch forward and reverse pedals. 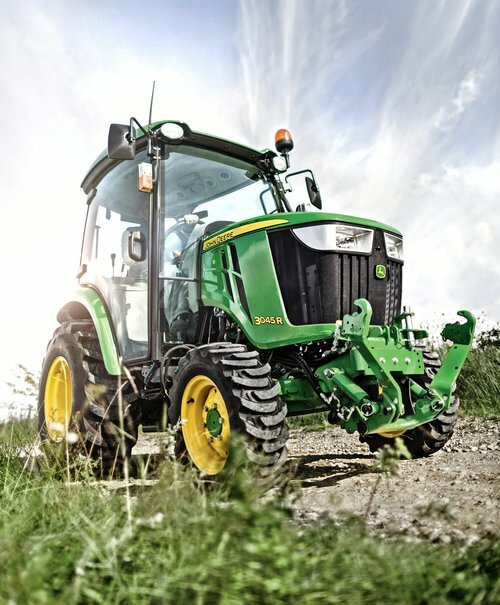 This transmission also features the unique combination of LoadMatch, MotionMatch and SpeedMatch operating modes for maximum performance and productivity in a wide range of tractor tasks. Options on the 3R Series compact tractors include a ComfortGard quiet cab, front hitch with pto and materials collection system. A standard joystick control is also available to operate mounted implements, including the new John Deere H Series front loaders. Other John Deere commercial machines on show at SALTEX 2015 include the X758 four-wheel drive diesel lawn tractor, TH 6x4 Gator, PRO 47V, C43 and JX90CB walk-behind mowers and the D45C scarifier.